well known for its brewery, museum, shop, events, venues and restaurant; but it has also been the setting of major events that changed the course of history. 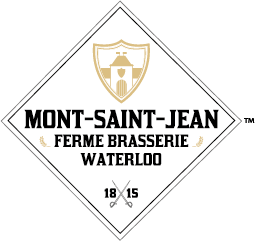 This rich history, spanning from the Middle Ages over the Battle of Waterloo to the present day, has given Mont-Saint-Jean Farm its character and fame. Already in the Middle Ages, Mont-Saint-Jean Farm served as a hospital since the De Wasseige family had donated it to the Order of Saint John (as mentioned in a charter of Henry I of Brabant from 1219). This Order, also known as the Knights Hospitaller, would later become the Order of Malta, and their mission was to provide care to the needy, whatever their beliefs. It was in this period that the Farm acquired its name and a Maltese cross, the symbol of the Order of Saint John, was carved into a stone initially placed above the Farm's entrance gate. Although it was broken in 1926, the stone was installed upside down above the farmhouse door, where it can still be seen today. care of commander Arnould from Piéton commandry, which was under the control of the Order of Saint John. From the mid-14th century onwards, the Farm was leased to different farming families. Boucquéau family, and one of its descendants became the owner of the property in the 18th century (he still was the owner in 1815 at the time of the Battle of Waterloo). The Farm witnessed its first major battle in 1705 when the Duke of Marlborough departed from Mont-Saint-Jean to attack the French army near Overijse. The current building dates from 1719 but the courtyard was not enclosed until 1765. It consisted of a farmhouse, a barn, livestock housing, an oven, a pigsty, a well and a chapel. In 1775, before the conversion works of 1778, the road to Brussels that ran east of the Farm was moved to its current position. This is an important detail because Napoleon, unaware of the road's relocation, attacked the wrong farm in 1815: La Haie Sainte. The importance of the site of Mont-Saint-Jean to the warring parties is evidenced by Napoleon's reference to the event as "the Battle of Mont-Saint-Jean" and not "the Battle of Waterloo"
Mont-Saint-Jean Farm played a key role in the battle after the Duke of Wellington had decided at the Duchess of Richmond's ball on 15 June 1815 to establish a field hospital there. Only a few days later, no less than 6,000 soldiers were treated at Mont-Saint-Jean under the supervision of Deputy Inspector Gunning of the Royal Army Medical Corps and his team (a commemorative tablet was installed to the left of the entrance gate in 1981). The Farm thus became known as "the English Hospital". However, the British were not the only ones who were treated here, since Gunning’s team also took care of many other victims who were scattered all over the Waterloo battlefield. According to contemporary eyewitnesses, the amputated limbs “piled up in the four corners of the farm's courtyard”, and the archives show that there were about 63,000 casualties from the four battles which took place between 15 and 18 June 1815. Among the important historical figures who were treated at Mont-Saint-Jean hospital were Colonel William Delancey and Lieutenant Colonel Alexander Gordon, aides-de-camp to the Duke of Wellington, the Duke's secretary (and nephew) Lord FitzRoy Somerset and William, the Prince of Orange, who was injured in the shoulder. The latter was then transferred to Brussels, but in 1826, his father, King William I of the Netherlands, had the Lion's Mound erected in the Prince's honour, across from the farm. In honour of the Duke of Wellington, the Prince of Waterloo, local brewers named their top-fermented dark beers "Waterloo". It is generally believed that this brew, which was preferred over the unhealthy water of that time, gave the soldiers courage to fight on the battle field. In 1846, the farm was sold to the Claus family who lived and worked here until 2014, when it was acquired by Anthony Martin, head of John Martin Brewery. He decided to take up the challenge of renovating this historical site together with his team. is that French novelist Victor Hugo finished his masterpiece Les Misérables while staying at the Hôtel des Colonnes (where the Carrefour supermarket is currently located) in May 1860. In 2015, an emergency plan was set up to save the site: this project was led by Anthony Martin and the architects of Dupont et Associés, specialised in listed buildings and heritage (they are also in charge of the restoration of the famous Château d'Hougoumont). Their common objective was to give this historical site a new lease on life. It was their ambition to turn the site into a first-class tourist attraction thanks to the historical role it played in the Battle of Waterloo as well as the more recent assets provided by Anthony Martin's ambitious plan. The installation of a microbrewery where Waterloo Beer is produced in the style of 1815 has brought a whole range of activities with it. The site of Mont-Saint-Jean is no longer a farm, but now boasts a restaurant run by renowned chefs who prepare dishes with beer, a shop where you can discover local products, a museum dedicated to the English Hospital of 1815 and a reception hall in the historical barn that can be rented for personal events. Professionals will discover a corporate events venue where they can combine a seminar, conference or team building activity with a visit to our brewery and a tasting session or an outdoor activity organised by one of our partners. Coming soon: a theme park for children, an educational farm, a living horse museum and a bicycle rental service, the first step in exploring the countryside by bike.